EILEEN Glass was travelling on the back of a truck from Kathmandu to London more than 40 years ago when her life took a turn that would change her forever. “I was a young person doing the ‘see-the-world’ trip … and I met a woman on the back of this truck who ended up at L’Arche in France,” she said on a recent visit to Brisbane. L’Arche (“The Ark” in French) is an international community – then in its infancy and formed by legendary Catholic Jean Vanier and friends – where people with and without intellectual disability, people of different denominations and cultures, live together in “mutuality and trust”. “I was in London so (her new friend) invited me to come and visit her (at the L’Arche community) in France, which I did,” Eileen said. “And that was a very powerful experience for me, because … I was at Monash during the late ’60s – so the years of the expressive revolution – and we were going to change the world, and we knew we were on a short frame to do it – it had to be done quickly and, of course, when I got to Trosly (France), to that original (L’Arche) community, it was something about people who weren’t into ideology and people who weren’t doing a lot of proclamation. “They were sort of saying, ‘Just be here, and live and be here for the person in greatest need’. “And it doesn’t take you very long to figure out the person in greatest need is not necessarily the person who lives with the most profound level of disability. “It can be the person who’s trying to run the show. Although young Eileen was attracted living that lifestyle, she only stayed in Trosly for six weeks “because I was still travelling”. “I went on to North America, and I ended up spending two years in the community of L’Arche Winnipeg in Canada, and that was really a place that changed me,” she said. “That was really a place that was a transformative place for me, because I was sharing life with a group of people – the community was only six months old – and I was sharing life with a group of people (and) most of them had lived in a large institution from their childhood, so, in coming into L’Arche, they were coming for the first time into a typical neighbourhood to live, and getting on a bus and going to work, and doing all that sort of stuff. “I had a background in teaching so it was sort of a natural fit for me to be able to help people to acquire skills and all that sort of thing but, of course, I too was confronted with the discovery that they were changing me and that friendship demands a level of personal honesty that isn’t necessarily called out of you in a professional capacity. “You put on the face to meet the faces that you meet, sort of thing, and you perform but the ‘who you are’ doesn’t necessarily get revealed. “And I suppose I stayed because at a certain point I discovered this is really … I mean, Winnipeg was also a time for me of really discovering the Gospel, like listening to Jean (Vanier), reading his writings, that sort of thing, and discovering that L’Arche was a place where I could really live the Gospel. “I stayed because at a certain point I realised it was worth the investment of my life,” she said. “In a particular way, the two things that have always been important about L’Arche for me which make it distinctive from most other disability-focused organisations is that we are international and that we are inter-denominational and inter-faith, or inter-religious. “So that dimension puts us in touch with the reality of the world. “When I turn on the news at night, I see the world as it’s affecting our communities. “Whether it’s a flood in Kerala, an earthquake in Haiti, the latest news from Damascus, what’s happening in Palestine …, all our communities are in those places, and so we are connected in a very real way. From her time at the roots of L’Arche, Eileen has become more deeply involved in leadership as well, including five years as international leader in a term that ended only two years ago. She continues as director of fundraising and development for L’Arche Australia. “I spent most of the 1990s co-ordinating our work in Asia and the Pacific, working with (L’Arche communities in) India, Japan, the Philippines, founding in New Zealand, working with Australia and taking up contacts in other countries,” she said. As part of her current role and drawing on her extensive L’Arche experience, Eileen visited Brisbane recently to promote a documentary showcasing L’Arche at its best. The film, Summer in the Forest, is made by former BBC documentary maker Randell Wright and goes to the heart of life in L’Arche. Heritage Films is showing the documentary around Australia, including a screening at the Balmoral Cinemas in Brisbane on May 13 at 6pm. Eileen’s familiar with the film, having been involved in its earliest stages when she was international leader with L’Arche. “The filmmaker made contact with us and talked about his project and then filmed, and the film was just being released at the time I finished (as international leader). So I was close to the whole process,” she said. “Randell Wright … wanted to make a movie that captured the experience at the heart of L’Arche. “It’s not a documentary that says this is how L’Arche was founded and this is how it’s run, and all that sort of stuff, but it’s much more entering into the kind of inside of the experience and the daily life of the people in the film. “So, in some ways, in terms of a documentary, it can feel unstructured in that it doesn’t have a direct line of narrative but it’s just as spontaneous as life in L’Arche is. One of the messages Eileen hopes audiences take from the film is “L’Arche is essentially about growing friendship – mutual friendships with people and, in that process, opening ourselves to being changed by the encounter”. 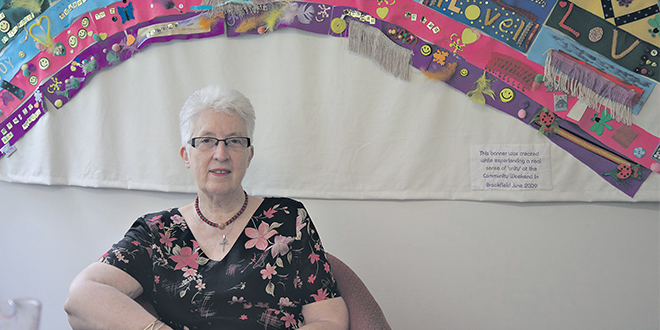 “So, if you think of the whole history of the Church in response to people with intellectual disabilities, there’ve been many religious congregations over hundreds of years who’ve cared for people with intellectual disability but the particular gift of Jean Vanier, the particular charism of L’Arche, is the discovery that people with intellectual disability change us,” she said.